All transactions are safe and secure with a reliable history in online purchasing behind each of our associates. Buy the House Snakes on a Cane t-shirt to own House clothing and merchandise. The design on these Snakes on a Cane House tees was inspired by a similar design created by actor Hugh Laurie. His design was used by FOX in a marketing campaign for the television show. This House Snakes on a Cane t-shirt is the perfect way to promote the hit medical drama. 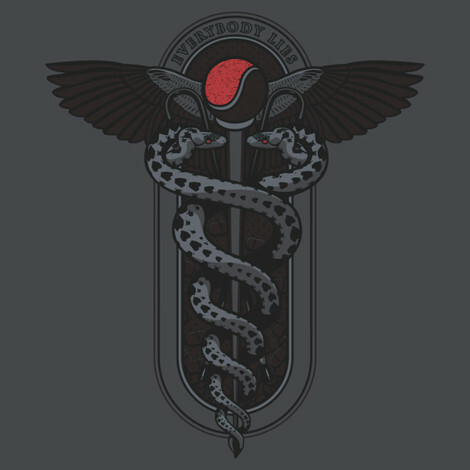 The design displays two snakes climbing up a cane, which looks similar to the Caduceus medical logo. Hugh Laurie presented FOX with his sketches for his design, which they accepted. The unique logo on these Snakes on a Cane House M.D. t-shirts is available on both regular and form-fit tees. Wearing one is a side effect of being a genius. In addition to the House Snakes on a Cane tee above, browse the House Clothing Gallery for more apparel like men's and women's clothes, kids shirts or hoodies.